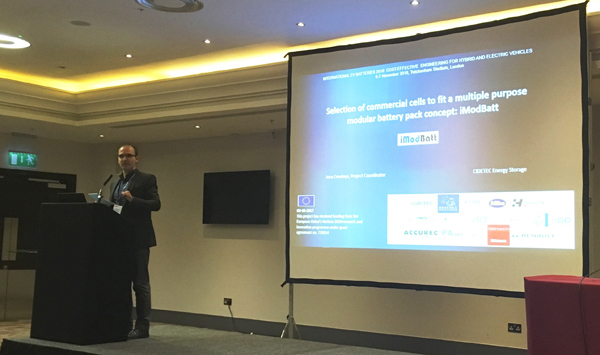 iModBatt was presented by CIDETEC Energy Storage in the International EV Batteries 2018: Cost-Effective Engineering for Hybrid and Electric Vehicles on the 6-7th of November 2018 in London, an event organised by the Institution of Mechanical Engineers. The conference was focused on understanding how actors in the field are planning to meet future demands on material resourcing, manufacturing, recycling and second life of EV and HEV batteries. Topics as EV range, battery pack performance and tools to simulate batteries’ short and long term behaviour were discussed. Commercial cells selection to fit the power profiles and requirements of two different vehicles: a mainstream EV (Renault Zoe) and an urban LEV (e.Go). Cells are selected keeping in mind the reusability and second life concepts through a modular battery pack. In parallel to the cell testing and selection activity a battery pack modular concept is developed in order to ensure a smooth shift from the mainstream EV application to the urban LEV in case of reuse.